The 2018 AAU International Collegiate Baseball Team would like to officially thank you our partners, service providers, and fans for your contributions to what has been a banner season. As we celebrate the third anniversary of ‘going global,’ we have all had the chance to reflect on the incredible past three years our athletes have experienced, both on and off the field, in Great Britain, France, Spain, Netherlands, Belgium, and now Scotland and Ireland. The remarkable support you bring – especially those of you in the international baseball community we interact with week-in and week-out coordinating, advising, and mutually encouraging – invigorates all of us to push for even higher levels of achievement in the future as we continue to bring international amateur baseball to the sport’s passionate fan bases throughout the world. The team’s success is due to the contributions of our key partners AAU Baseball, Baseball Scotland and Baseball Ireland’s commitment to achieving world-class logistics, infrastructure and support necessary for unparalleled international amateur baseball operations. Innumerable others also contributed in many ways large and small, and for all the fans who accompanied the team in Scotland and Ireland and those we picked up along the way and following online … wow! All of the above reinforces AAU International Collegiate Baseball’s growing reputation both in the United States and overseas. It burnishes the profile and reputation of all the athletes who pull it off on the field, in the classroom and generally make it happen. As a result, the excellence has never been higher. The 2018 season continued that trend, and we are excited to see what the future brings as we enter our fourth year playing internationally. Clearly, that 2016 first year was the start of something good. 2017 was a continuation. And while we hated to see this 2018 season end, we are excited to put the right pieces in place again to make this premier collegiate international amateur baseball opportunity a reality again in 2019 and beyond. 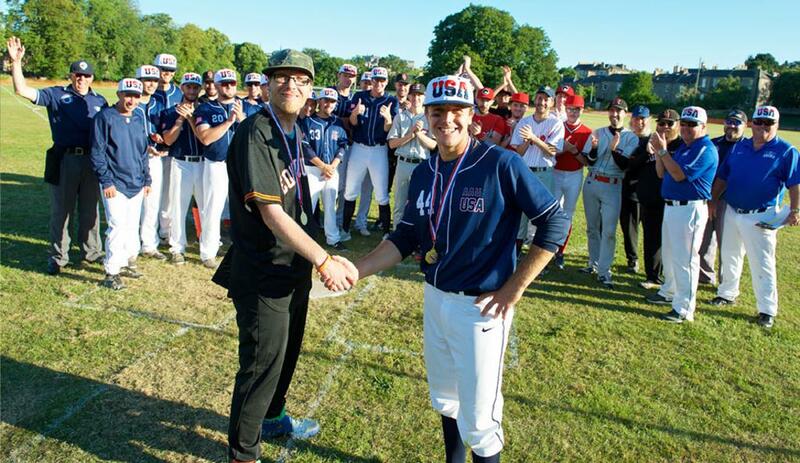 So on behalf of the AAU International Collegiate Baseball Team and key partners AAU Baseball, Baseball Scotland and Baseball Ireland ... thank you, thank you, thank you! ©2019 AAU Baseball / SportsEngine. All Rights Reserved.